Two talented, yet largely unproven former U.S. Olympians look to hit it big, both with their fists, and subsequently, with a fight of greater magnitude when Vanes Martirosyan and Demetrius Andrade face off on the Nov. 9 HBO Boxing After Dark tripleheader. For their efforts, the winner will receive the vacant 154 pound WBO title; the loser will regress to oblivion. The fight’s been in the works for so long, it looks as if HBO has forgotten there’s still one in the first place. In recent weeks they’ve offered none of the TV promotion as is customary for the fights they showcase. The faceoff between the two unbeatens was first slated for the Nov. 23 Manny Pacquiao/Brandon Rios pay-per-view because HBO wanted nothing to do with Martirosyan, who in the network’s eyes had turned in two previous duds for them with his unanimous decision victory against Joe Greene, and draw with Erislandy Lara. In all fairness, Andrade, a 2008 Olympian who’s stopped five of his last seven opponents, none on TV, is not the scintillating type either. Top Rank’s Bob Arum then pulled a few strings and landed the fight as the co-feature to Julio Cesar Chavez, Jr./Brian Vera on Sept. 7. After that fight got postponed to Sept. 28, Top Rank moved them to the American Bank Center in Corpus Christi, Texas, which is where they’ll face off next Saturday. This title fight is exactly what the 27-year-old Armenian has been pleading for well over three years now. His seven-year career has been at a standstill because he’s fought a garden variety of gatekeepers. He admitted some of that was his own doing, like not taking fights he should have, and lacking consistency with his team of managers and trainers. That’s all fixed now. With manager Cameron Dunkin at the wheel, and trainer Roma Kalantaryan in the corner, Martirosyan is ready to once and for all hit the main stage – and stay there. It was almost a year ago to the date when Martirosyan, (33-0-1, 21 KOs), a 2004 Olympian, battled Lara to a technical draw. The fight ended in the 9th round after an accidental clash of heads opened a cut over Martirosyan’s left eyebrow. What the fight did do, however, was give “The Nightmare” new-found confidence as he proved to he and his naysayers that he belonged in the ring with elite fighters. It also prepared him for “Boo Boo” Andrade, who like Lara, is a southpaw. Ernie Zavala, the former southpaw boxer turned trainer, has been working mitts with Martirosyan this camp as lead trainer Freddie Roach is in the Philippines with Manny Pacquiao. That will be easier said than done. Andrade, a two-time U.S. National Champion, has an equal and comparative set of skills as Martirosyan does. The fight is a classic 50/50 matchup, as well as a dark horse to steal the show as soon as they let their hands go. But if both revert to their amateur backgrounds and feel each other out for most of the fight, loud chants of “Boo Boo” will be raining hard – and it won’t be a rallying cry for Andrade. Martirosyan said that he will go for the knockout as well. After all, he wants to stay on premium cable and off of Top Rank TV’s online feed for good. Kalantaryan, who’s primarily trained Martirosyan since he was 13, said that the fight is happening at the right time for his fighter. 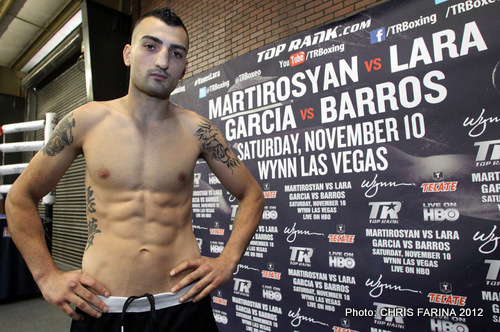 As an amateur, Martirosyan beat future titlists Timothy Bradley Jr., Austin Trout and Andre Berto. A convincing victory against Andrade will put his career on the fast track to similar household names.